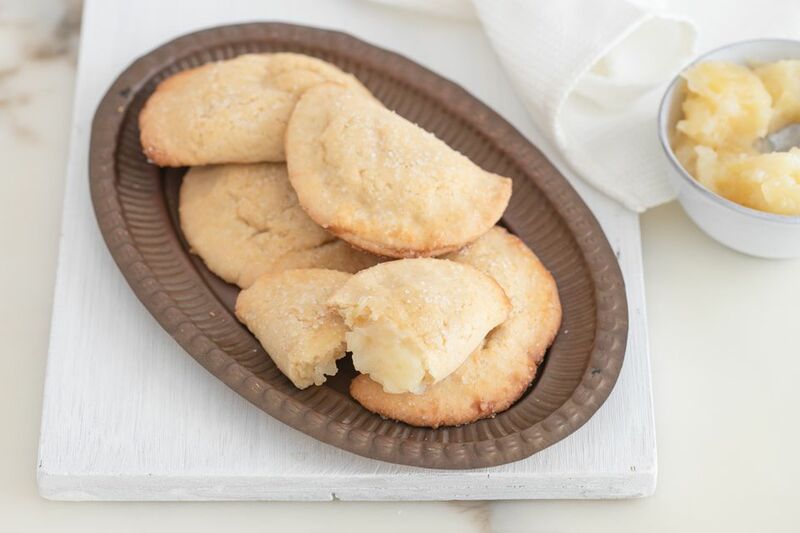 When chocolate chip cookies just won't do, try this delightfully tropical pineapple turnover and cookie recipe. This sweet treat is slightly out of the ordinary, but still a crowdpleaser. Mix together the sugar, shortening, eggs, and vanilla. Stir in the flour, salt, and baking soda. Cover and refrigerate for at least 1 hour. Drain the pineapple, reserving 1/2 cup of the syrup. Mix the sugar and flour in ​a saucepan. Stir in the pineapple, reserved syrup, lemon juice, margarine, and a dash of nutmeg. Cook, stirring constantly, until mixture thickens, about 5 minutes. Cool pineapple filling completely. Preheat oven to 400 F. Roll dough about 1/16-inch thick on a floured surface. Cut into 3-inch rounds or squares. Spoon about 1 teaspoon of filling onto one side of each circle, leaving enough of an edge to seal. Fold the dough over filling and pinch edges to seal. Place cookies about 1 inch apart on ungreased baking sheets. Brush with milk and sprinkle with sugar. Bake until lightly browned, about 8 to 10 minutes. Immediately remove from baking sheet. If using self-rising flour, omit salt and baking soda.